LOS ANGELES (CBSMiami) – Fists fly on a Southwest Air flight to California. The jet had just landed at the Burbank Airport when two men got into it. Airlines have declared war on passengers, and passengers have reciprocated. There are many unreported incidents, too. Last time we flew after Christmas 2016, there were delays at the Baltimore Airport and hungry, upset people got into it at the McDonald's in the airport, since there were too many customers for the staff to handle. This decline of ours is scarey. Sheesh! 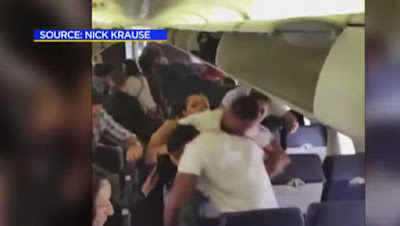 Fights on airplanes are common! For pity sake! What have we gotten into?! Trump fires the head of the FBI three years into his ten year term, companies and customers declare war, and in case people in charge have not noticed, things are beginning to fall apart. The Republican members of the House vote to essentially deprive millions of health care! Pretty soon there'll be fights in hospitals!